This week is a crazy weather week for me! I live in central New Mexico, and you'd think we would have the best weather around. But, as I am writing this, I woke up this morning to 42 degree temperature. Oh my, is that a bit chilly. The skies here have been cloudy and dreary the last two days. I wish it would either rain, or let the sun out. Anyways, the talented ladies over @ Stampin' Queens Sketch Challenge, have been hard at work, creating some gorgeous cards to help inspire you to play along with us! So, grab your Stampin' Up! supplies, and lets create something beautiful! And this is how I did it, and what I used. 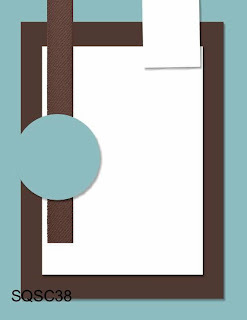 The card base is Rose Red card stock. The bottom panel piece is made up of First Edition DSP matted onto a piece of Soft Suede card stock. The main panel of the card is a piece of Naturals card stock matted onto a piece of Pink Pirouette card stock. For the stamp, I colored the image with my markers, huffed on the 'colored' stamp and then stamp. I cut the banner piece from the same naturals card stock. I stamped the sentiment twice, once on the card front, and then again on the banner. 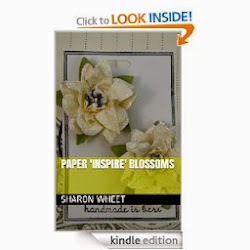 I made the paper blossom from the text paper. I used the Floral Fusion die. I crinkled the petals, and stacked them. I outlined the petals with a glue pen and dipped the paper blossom into a tub of dazzling diamond glitter. I adhered a small leaf sprig made from Pear Pizzazz DSP and the leaf die. The top piece is actually a scrap piece of fabric. I used the Lots of Tags die to cut this shape. 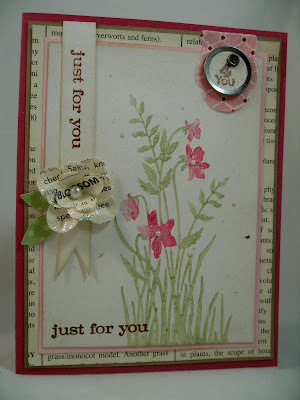 I added a mini vintage tag to the center and attached the tag with a vintage trinket brad. I stamped the '4 you' in soft suede classic ink. I spritz the whole card with some home-made shimmer mist. I added two half faux pearls to the floral centers of the stamped piece. 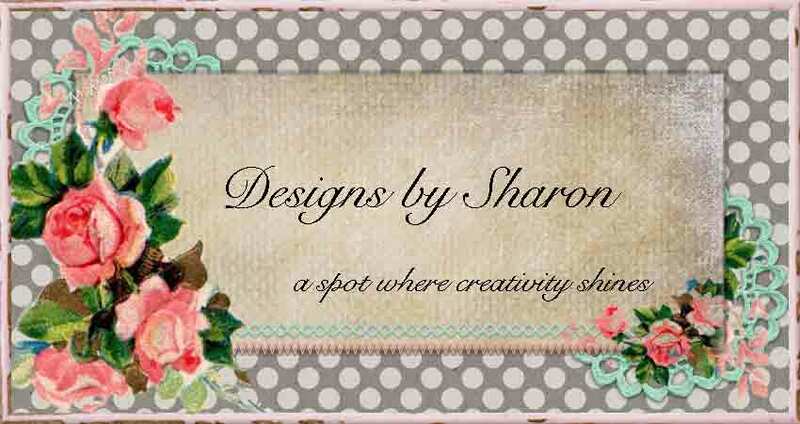 Labels: first edition DSP, floral fusion die, just because, little leaves die, mini vintage tags, tiny tags, vintage trinckets.